Rely on our info and reviews to steer you towards the right products that’ll keep your yard lush, green, and healthy. Whoever said, “The grass is always greener on the other side” probably wasn’t using the right stuff. When it comes to keeping a yard in top condition, all you really need is the best lawn fertilizer for your climate and conditions, and a few dates circled on the calendar. Once you’ve determined what’s ideal, simply apply as instructed and follow up as directed on the package. This guide will teach you the fertilizer fundamentals and offer reviews of some of the highest-rated products on the market. Understand the numbers. You’ve no doubt noticed three digits printed on lawn fertilizer labels. Known as the NPK ratio, the numbers stand for the percentage of basic nutrients (N for nitrogen, P for Phosphorus, K for Potassium) the fertilizer contains. If a fertilizer’s NPK ratio is 12-0-10, for example, it contains 12 percent nitrogen, no phosphorus, and 10 percent potassium. Generally speaking, nitrogen helps plants stay green, phosphorus promotes root growth (though can be controversial due to its tendency to contaminate water), and potassium guards against drought and disease. Depending on the type of turf you have and the climate where you live, one combination will be better than others. Check the package against your grass species to ensure it’s got the optimal nutrient balance for your specific needs. Select your type. Once you ascertain your best NPK number, it’s time to decide between a synthetic or organic fertilizer. Synthetic varieties are engineered from minerals, gasses, and even waste with the intent of delivering fast results—sometimes within a matter of days. The downsides to synthetic fertilizers are their reputation for “burning” (i.e., killing) grass if used in too heavy-handed a manner. There can also pose environmental damage and health risks if they leach into the local water supply. Organic fertilizers are made from living organisms—anything from cottonseed or peat moss to bat guano and blood or bone meal. They can take a bit longer to work their magic—it’s often a few weeks before results are visible. Although they require a bit of patience, the environmental and health risks are low. Find your formula. There are two fertilizer formulas: liquid and granular. Liquid fertilizer, which comes as either a fluid (requiring dilution in water) or a powder (to which water should be added), tends to require more frequent application than granular. It can also pose an environmental risk if it contaminates the local water supply in large amounts, leaking lead, cadmium, and arsenic via storm drain runoff and causing algae blooms as well as long-term public health risks. That said, it’s an effective way to see quick results, so it’s only recommended when you need truly rapid results and can use it sparingly. Granular fertilizer tends to operate in a slow-release fashion, taking up to a month or longer to deliver results but requiring less-frequent follow-up. It also poses far less of a health risk overall, so it’s generally a better option unless you’re not willing to wait a few weeks for your yard to green up. After thoroughly comparing reviews from consumers and publishers alike, we’ve rounded up three of the most highly rated options available today to help you find one that fits the bill for your particular yard. 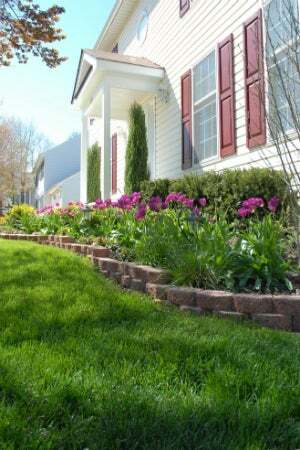 Check out the top picks for best lawn fertilizer below. Amazon reviewers appreciate this organic granular fertilizer for its gentle, reliable nutrient delivery system. 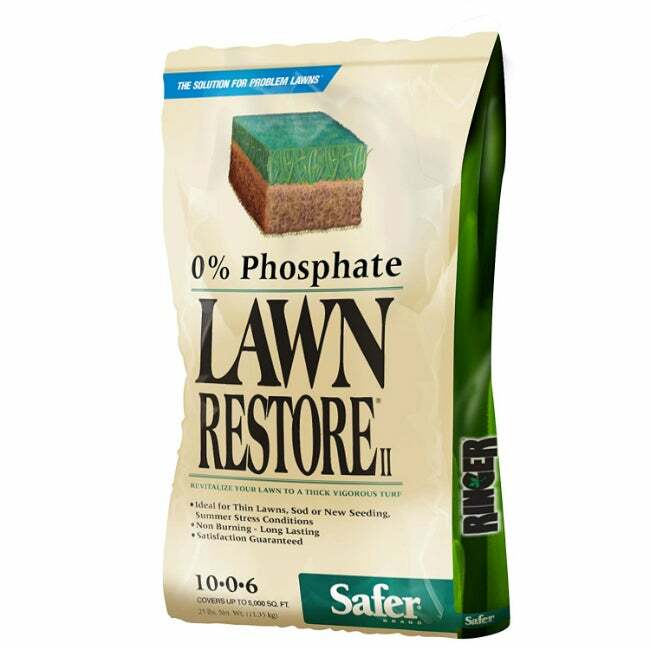 Completely plant-based, Safer Brand Lawn Restore II uses no bio-solids, making it free of the unpleasant odor associated with many organic fertilizers. Covering up to 5,000 square feet per 25-lb. 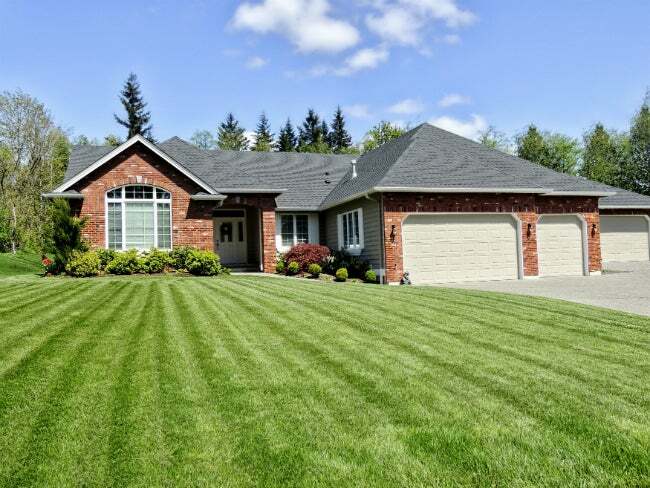 bag, its 10-0-6 NPK formula is high in nitrogen and potassium with no phosphates present, making it a good pick for eco-conscious homeowners who want a lush, green lawn without the slightest environmental or health risks. One application lasts around 10 weeks or longer. Available on Amazon. 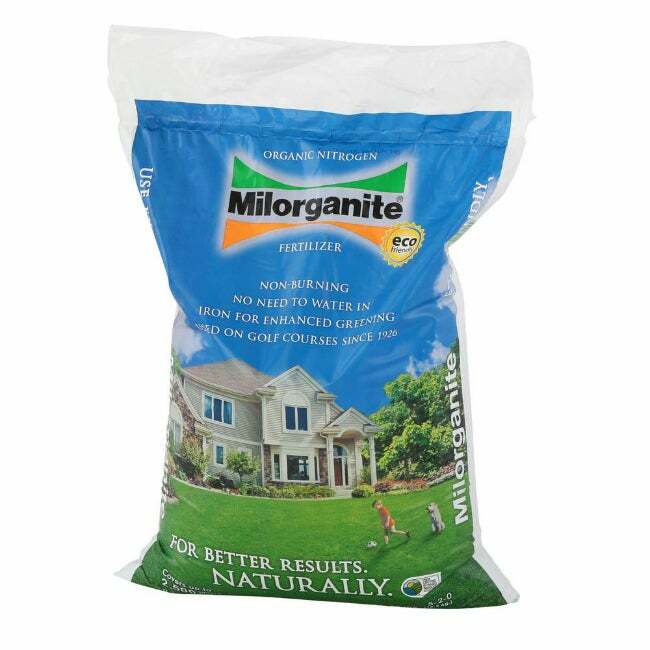 A granule-based product that’s high in iron as well as the usual nutrients, Milorganite Organic Nitrogen Fertilizer has been known for greening up lawns since it was first used on golf courses in the 1920s. It doesn’t require water in its application, and it lasts up to 10 weeks, making it a no-fuss, no-muss favorite among Home Depot shoppers who overwhelmingly give it five stars, citing its gentle 5-4-0 NPK ratio and its longstanding track record of non-burning, earth-friendly effectiveness. Available at Home Depot. 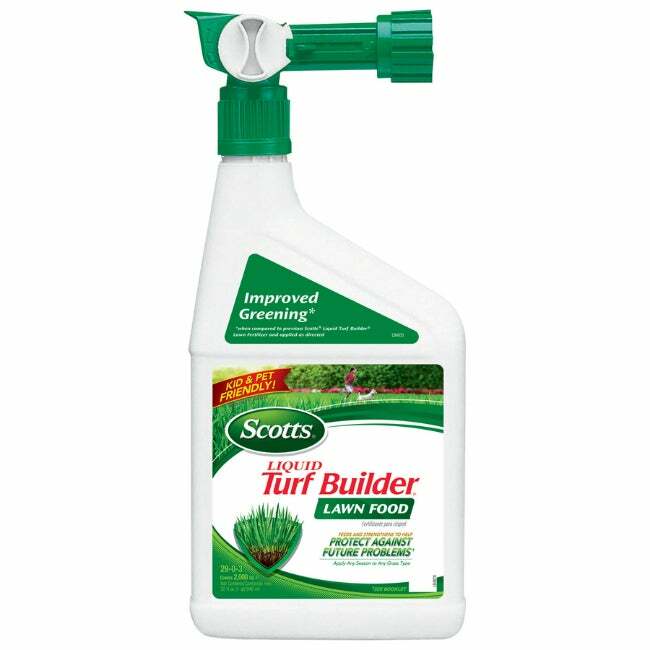 Popular with Lowe’s shoppers for its ease of use, friendly price point, and fast-acting ability to green up most grass fast, Scotts Liquid Turf Builder Lawn Food is a favorite option among those can’t wait for results. Safe for most grass types, the all-season fertilizer is high in nitrogen (with a 29-0-3 NPK ratio) and covers up to 2,000 square feet of lawn per bottle. Great as a “shot in the arm” for a patchy, browning lawn that needs some quick rejuvenation, its effects can last for up to two months. Available at Lowe’s.